If your home has a tankless water heater, you probably don’t think too much about it unless there’s a problem. When something isn’t functioning properly, the first step is to take a look at your water heater’s monitor or controller to see if there’s a flashing error code. Often, you can quickly determine the cause of a malfunction by being able to identify the code. The following codes for three of the leading manufacturers’ tankless water heaters is a quick guide to help you diagnose a potential malfunction. NOTE: The definitions of tankless water heater error codes are for informational purposes only. We strongly encourage you to hire a licensed plumber to perform the diagnostics and physical troubleshooting of your tankless water heater. If you take the matter in your own hands, you run the risk of voiding any applicable warranty. Rheem also offers a complete line of tankless water heaters, including the Rheem RTGH natural gas condensing tankless water heater and the Rheem RTGH propane condensing tankless water heater. As with other brands, Rheem tankless water heaters display error codes to indicate specific malfunctions. Rheem fault code 00 – Indicates 1-hour continuous combustion. To correct this code, close all hot water taps to reset the unit. Turn off or remove circulation pumps. Rheem fault code 05 – Indicates imperfect combustion. To remedy the problem, clean the air inlet filter, air fan and exchanger fins. Check that the air ventilation openings are open and clean, if necessary. Rheem fault code 10 – This is the false flame detection code. Before calling for service, check to make sure that nothing is blocking the flue inlet or exhaust. Rheem fault code 11 – No ignition. Check to make sure there is gas to the unit and that the pressure is correct. Ensure the ignitor is operational before calling for service. Rheem fault code 16 – This is an over temperature warning which could indicate a possible clogged heat exchanger. There may also be restricted air flow around the unit. Call for service. Rheem fault code 29 – This code indicates that the heat exchanger outlet temperature is too low. By cleaning the heat exchanger air inlet, the problem is typically resolved. Rinnai is known for their innovative tankless water heaters, such as the RUCS65iN and the RUR98iN. Rinnai models. Featuring ThermaCirc360 technology, Rinnai water heaters are a solid choice for homeowners looking for an efficient, quality water heater that will save energy and produce unlimited hot water. Rinnai fault code 02 – No burner operation during freeze protection mode. Call for service when your unit is showing this code. Rinnai fault code 10 – Air supply or exhaust blockage. Check to see that nothing is blocking the flue inlet exhaust or fan. Rinnai fault code 11 – No ignition. Check to make sure the gas is turned on at the water heater, gas meter or tank. Ensure the igniter is operational. If gas is being supplied to the tankless water heater and the igniter is working, call for an evaluation by a qualified plumber. Rinnai fault code 16 – Over temperature warning. Check for restrictions in air flow around the unit and vent terminal. Make sure the heat exchanger is not clogged and that low water flow is not causing short cycling. Rinnai fault code 32 – Outgoing water temperature sensor fault. Check sensor wiring for visible damage. This code may indicate that a sensor needs replacement which requires a service call. Bosch offers several models of tankless water heaters, including the Bosch Therm 830 ES Non-Condensing tankless water heater with 8.3 gallons per minute capacity at 35 degrees Fahrenheit and the Bosch Therm C 1210 ES Condensing tankless water heater with more than 12 gallons per minute capacity. These tanks are built to last with warranties that exceed many from other manufacturers. When there is a malfunction, an error code will appear on the LCD display. Bosh fault code 11 – Indicates a problem with the tankless water heater’s ignition. Typically, if you receive this fault code, your unit will not work. Before calling a licensed plumber, check to make sure your gas valve is open and supplying gas to the unit. Bosch fault code 90 – Indicates low gas supply pressure. To remove the code, turn the remote control unit off and turn on the hot water tap. Then, press the ‘on’ button on the water temperature controller again. If the fault code remains, you will need to call for service. Bosch fault code 92 – This typically means that the water heater’s neutralizer will need to be replaced soon. You can continue to run your hot water heater with fault code 92, but the flow of hot water will be reduced. Call for service to replace this part. Bosch fault code 99 – Indicates an abnormal combustion. Your water heater will shut down if this code appears as a safety precaution. Don’t attempt to light the burner within the unit by hand. Call for service. 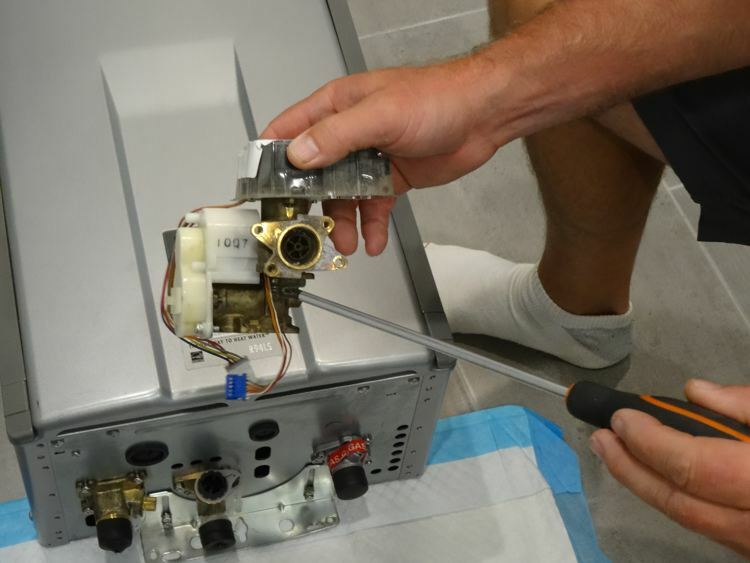 While it’s a good idea to understand what is going wrong with your tankless water heater, physically troubleshooting the unit is best left up to the professionals. If you’re in the Dallas / Fort Worth, Texas area, call Horizon Plumbing Service at 817-461-1117 to get your tankless water heater running smoothly again.